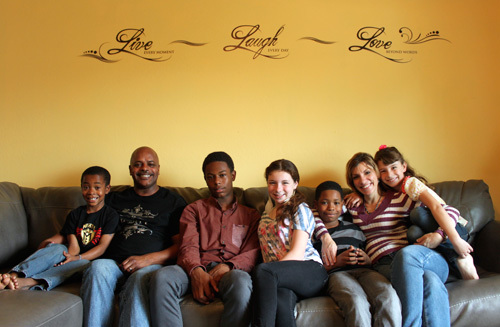 Our team first encountered the Mullins family at the Art & Soul festival last August in Oakland. Bubbly, talkative, charming, and wielding a raucous caravan of five children from five to fourteen years old,—the “fab five”—you couldn’t miss them. 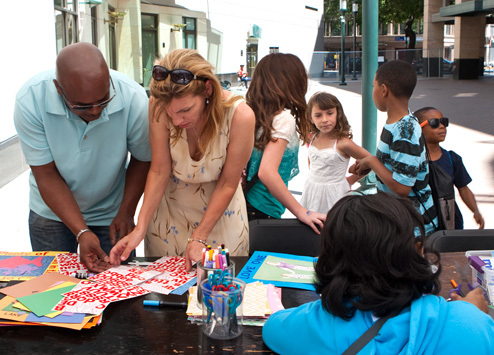 Over the past few months, the Oakland Museum has been embarking on a community listening tour. At various festivals and community events, we’ve posed the question: what is your dream for your community? Kaitlyn, Shelly and Thomas’s twelve year-old daughter, had a dream in mind, but initially shied away. Returning to the booth, she told us, “My dream is to end racism,” and began to share her family’s story. We were struck by her conviction and seriousness; it’s not everyday a twelve-year old speaks frankly about racism. The Mullins family was unmistakable at the Art & Soul festival, Brady Bunch comparisons aside, they look like a stock photo for a multiracial society. Shelly and her two daughters, Kaitlyn and Audrey, are caucasian, and Thomas and his three sons, Christopher, Chase, and Chandler, are African American. Shelly and Thomas’s children, all from previous marriages, get along like siblings; they spend holidays together, play video games together, and occasionally drive each other crazy. Christopher, 14, a freshman in high school and the only teenager of the lot, shows signs of amusement with his younger siblings’ antics, but often retreats to his room to attend to the serious matter of schoolwork. Chandler and Audrey, both eight years old and formerly the “babies” of their respective families, have become playmates. Kaitlyn and Chase are best friends. The Mullins family at the 2013 Art & Soul Festival. Though the Mullins make for a great photo-op, and interracial couples are often celebrated as symbols of racial progress, Shelly and Thomas don’t sugarcoat their story. Their experience as a couple opened the door to a barrage of harassment, and, in Shelley’s case, rejection from her former community. Shelly and Thomas live in Antioch, a Contra Costa city, renting the house that Shelly grew up in. 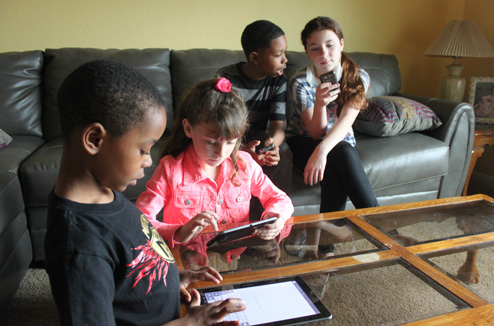 They serendipitously met when Thomas was on assignment with AT&T to install Shelley’s cable. Shelly, an elementary school teacher, was a stay-at-home mom. Thomas’s first impression of Shelly, he said, teasing her, was that she was “a bubbly Christian woman, who played her Christian music.” Shelly and Thomas remember talking to each other about racism on the first day they met. Their discussion about racism, a taboo subject in a society that often imagines itself post-racial, was both a sign of their instant ease with each other and their belief in bringing racial issues into everyday conversation. When Thomas finished installing Shelly’s cable, the two stayed in touch, texting and calling each other. Five years later, they are married, and their love exudes such warmth that has almost a three-dimensional quality. They take turns recounting the details of how they met. They both recall that the first day on the job, Thomas was over for six hours. Their relationship, however, has often been a painful journey, and remains controversial for Shelly’s family and former community. The marriage created such a rupture in Shelly’s social world that she refers to the time before she was with Thomas as “my old life.” Shelly is forthcoming about growing up in a racist environment, yet she was still surprised by the level of abandonment she experienced. Thomas and Shelly in their Antioch home. While Shelly said that marrying Thomas opened her eyes to racism, Thomas never had the luxury of ignorance. The burden of the person of color in an interracial relationship is not only to be the subject of racism, but also to serve as a mediator to their spouse who has a very different life experience. Shelly and Thomas were instantly shunned and harassed by her community, and Shelly witnessed the casual discrimination that Thomas faced at restaurants and clothing stores. As an only child, the community response was particularly alienating for Shelly. Though Antioch became an unfriendly place, she still considered it home. It was the place she taught and where her daughters went to school. “What my children have seen is just the fact that people have stopped speaking to me,” Shelly said. “People will not speak to Thomas. It just changed. I mean to the point where I didn’t feel comfortable with my community for a long time. I thought, God, is everyone a racist? Kaitlyn and Audrey are effusive about their love for Thomas. Before Shelly and Thomas got married, Shelly said, the girls were very sheltered. Chandler, Audrey, Chase, and Kaitlyn are on the same page about video games. Thomas, who takes Kaitlyn and Audrey around Oakland, joked that he makes himself sound like a savior—but Shelly says it’s true. Thomas, who grew up in West Oakland and attended McClymonds High School, brings his daughters to Oakland so they can experience the excitement of the city and the sense of community he felt growing up. Every September, Thomas tries to get his family to come to the McClymonds annual alumni BBQ with him. Thomas is nostalgic about the Oakland of his childhood, which he says he spent getting into honest mischief, fishing at Jack London Square and to Shelly’s horror, hopping trains. He and his friends visited movie theaters like the Coliseum the Roxie, and the Lex, which he frequented for the kung fu movies. Though Thomas and his mother have moved to Antioch, his sons still live part time in Oakland with their mother and attend public school there. Christopher, Chandler, and Chase had never been sheltered in the same way that Kaitlyn and Audrey were. Shelly and Thomas’s marriage doesn’t not seem to have inspired any revelations about racism for the boys, or at least revelations that they are comfortable discussing openly. Chandler, Thomas, Christopher, Kaitlyn, Chase, Shelly, and Audrey. 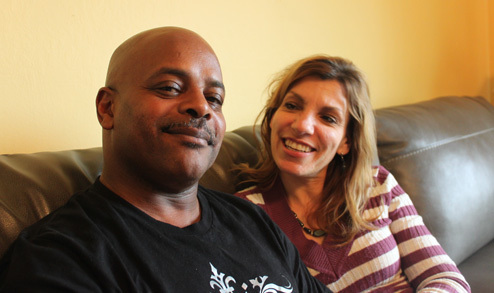 Shelly and Thomas’s life together is often about navigating Oakland and Antioch, their homes and adopted homes, two cities that are only an hour away from each other but sometimes feel like worlds apart. Shelly said that when she and Thomas have all the kids, they often start the day but getting in the car and driving, to Roberts Park or Redwood Park, and festivals in Oakland like Art & Soul where we first met them. “I guess this interview is about Oakland as a community,” Thomas said. The Art & Soul Festival provided a window for storytelling. The Mullins’ story is one that is honest about the difficulties of creating a new family structure. It is not an easy transition for children or parents. But their story shows that amidst the difficulties, the revolutionary act of love prevails.